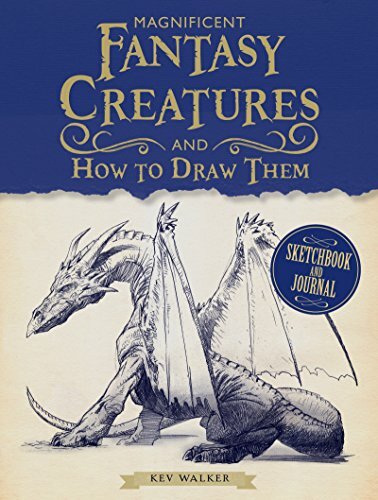 This is a fun and accessible book for those who want to learn to draw fantasy creatures. The author Kev Walker is a writer and artist drawing for graphic novels, video games and collectible cards. This book is available in paperback and ebook format. The paperback format has 160 pages and is split between content and blank pages for you to draw on. There's a brief section on the tools you need and basic drawing techniques. Then it jumps into featuring the 30 fantasy beasts such as vampire, werewolf, kraken, sphinx, minotaur, dragon, yeti and many more. This is not a step-by-step book that guides you on drawing a creature from scratch. It's one that shows you the finished product, and highlights certain areas to focus on. For some creatures, the focus would be on the claws, others would be the texture of the body, or maybe the posture or bone structure. There are many tips but not as much on the actual drawing techniques. Anyway, with the example artworks, you should probably be able to replicate the strokes easily. The penciled examples are quite clear. Best way to use the book is to find some photo reference online, and apply the drawing techniques taught, draw and modify as you go along. Overall, it's a nice introductory to drawing fantasy creatures.